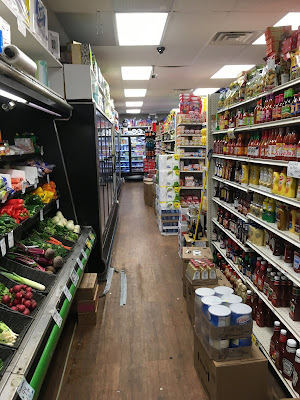 Turning a Snapshot post into a Look Inside post isn't hard for many of the small greengrocers in New York City, most of which are a single room with one or two aisles of produce -- and no front wall (because most are open 24 hours). From what I can tell, Jenny's Farm does not necessarily target any specific ethnic group, but is just generally a greengrocer shop. Jenny correctly uses plurals for her vegetables and debit cards, but once again accepts only one food stamp. Jenny's Farm is located at 8322 5th Ave, Brooklyn, NY. 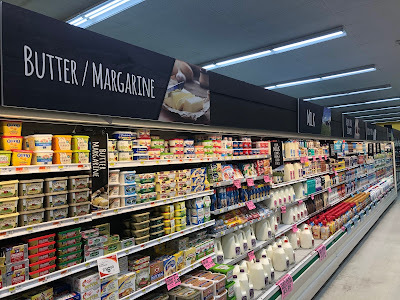 I went back to Extra Supermarket in Maplewood on Friday, which we originally saw in a tour back in November 2017. Since then, there have been a few changes -- nothing earth-shattering, but some nice updates. Exterior photo from my original visit. Nothing has changed outside. Plus, when I went back on Friday, it was pouring rain and I was almost run over by a Krasdale truck. Just another day in the life of The Market Report blogger. 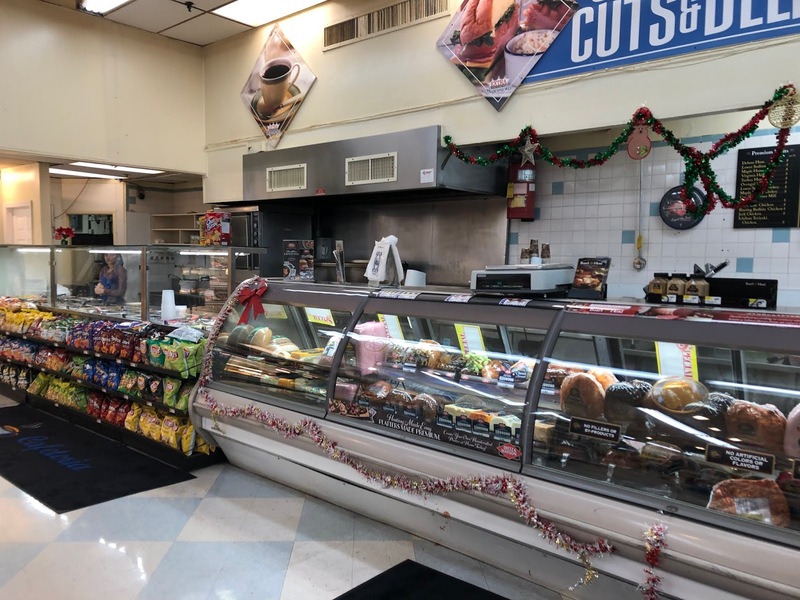 Closeup of the deli and hot food counter in the front of the store that wasn't included in the original post. 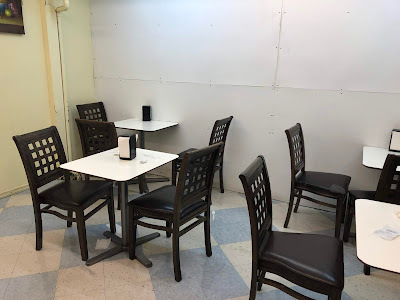 Also, I'm not sure whether I missed it or if it wasn't yet there, but I caught this time a small café seating area just inside the alcove visible to the left above. The furniture looks pretty new, so maybe it wasn't there a year ago. The meat backroom is on the other side of this wall. New dairy cases along the back wall. Check out the old cases here. 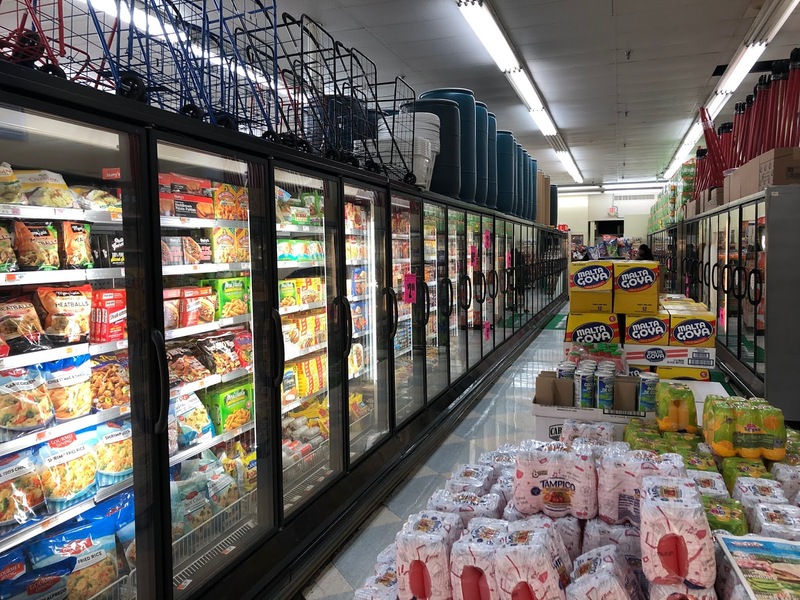 Brand-new frozen cases in the last aisle. No more open deck freezer cases! If you want to check out the changes for yourself, the store is at 719 Irvington Ave, Maplewood, NJ. 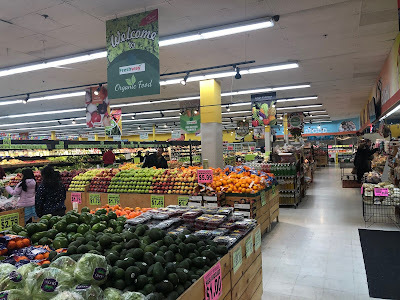 We've been to this store a few times now, first seeing it as a Key Food Marketplace in photos from May 2016, then revisiting it as a SuperFresh with photos taken in April 2018. 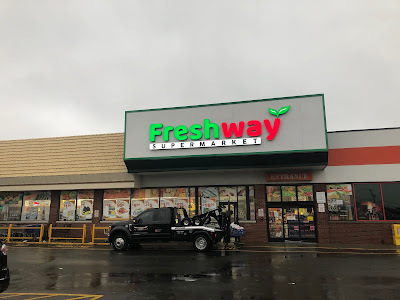 The Food Basics-turned-Key Food Marketplace-turned-SuperFresh has now been turned Freshway, along with another one of owner Kevin Kim's locations in Staten Island, NY at 375 Tompkins Ave. Okay, I didn't say updated well, I said updated. Either way, the store is still looking really good, although a few of the specialty departments didn't make it (hot food, juice bar, and sushi are all closed). 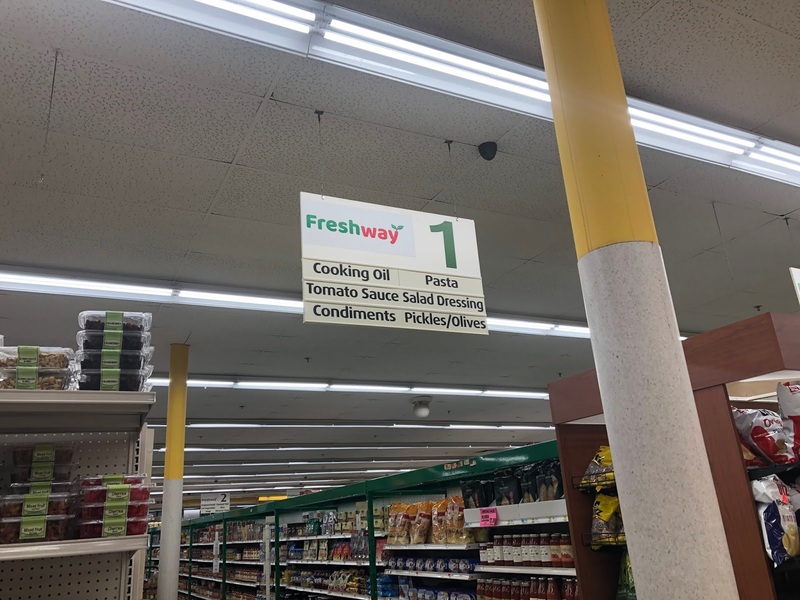 New logos on the aisle markers. 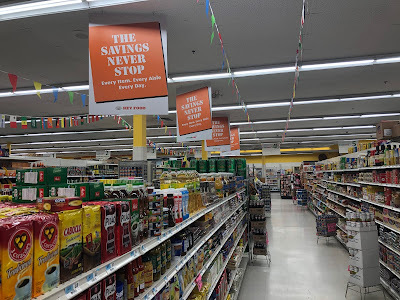 They were never updated to the SuperFresh logo; in fact, these are the original Food Basics aisle markers which had had Key Food stickers on them. Inconsistent updates in the international aisle. Yes! Eggs are no longer in this area, which I commented on in the previous post. It would be too much to ask, I suppose, for the ampersand to be removed or for the area to be painted. Updated category markers! I made fun of the previous signs on the earlier post. Front-end still proudly displaying its Key Food sign, which remember was two banner changes ago! 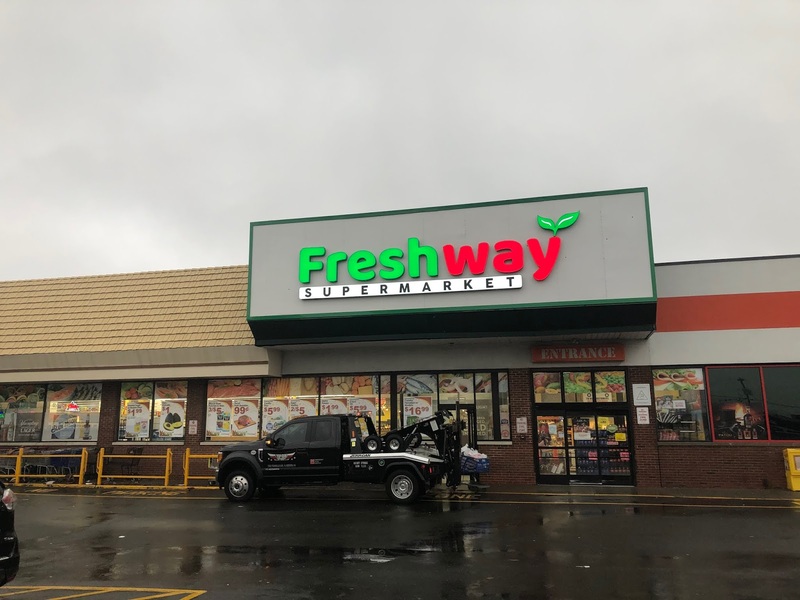 The store is located at 289 Bergen Blvd, Fairview, NJ. Do you like my oval around the Met Foodmarkets logo for the map here? If you think either I've really gone crazy, or that I need way too much encouragement, just hear me out on this one. So the problem stems from the fact that the Met logo on Met's website is high resolution, but the inside of the "e" is white while the rest of the background is transparent. That was way too obvious when I put the logo into Adobe Illustrator, and rather than open up Photoshop to remove the white spot, I somehow thought it would be easier to just make an oval. When that looked strange, I added the gradient border. 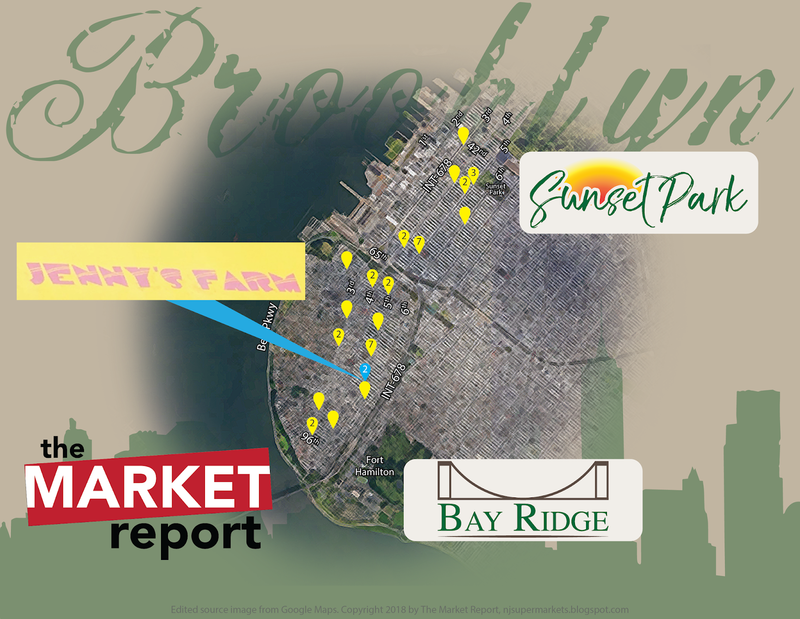 Which doesn't look great, but at least it's been done before, on the circular for the Met up in Sunset Park (in the past). There you go. Now, for our store tour! Although I don't know what the building was previously, it was almost certainly not a supermarket. It didn't have any windows along the front and is clearly a Frankenstein monster of several different rooms and spaces combined pretty haphazardly. 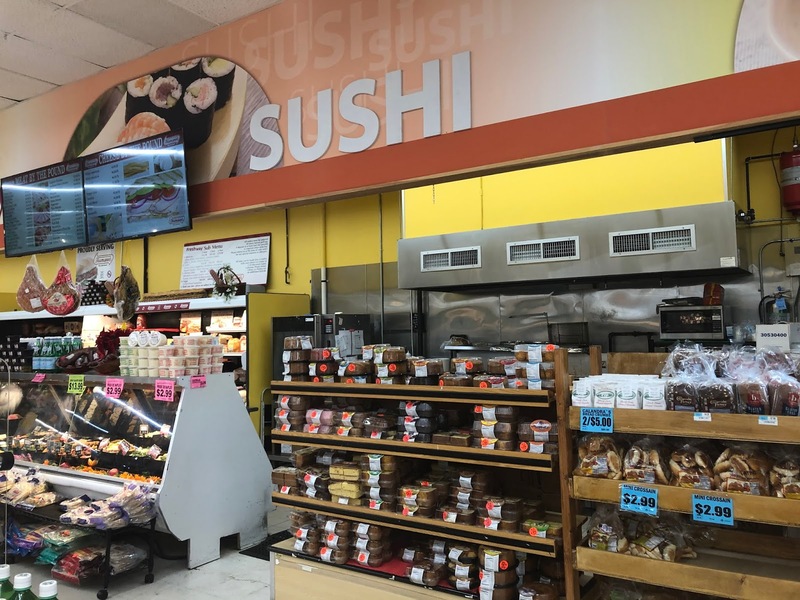 You enter and exit through the same door on the right, with a checkout counter along the right side wall. Produce is in the second room, on the left above, with meat at the back of the right-side room and dairy along the right side wall. 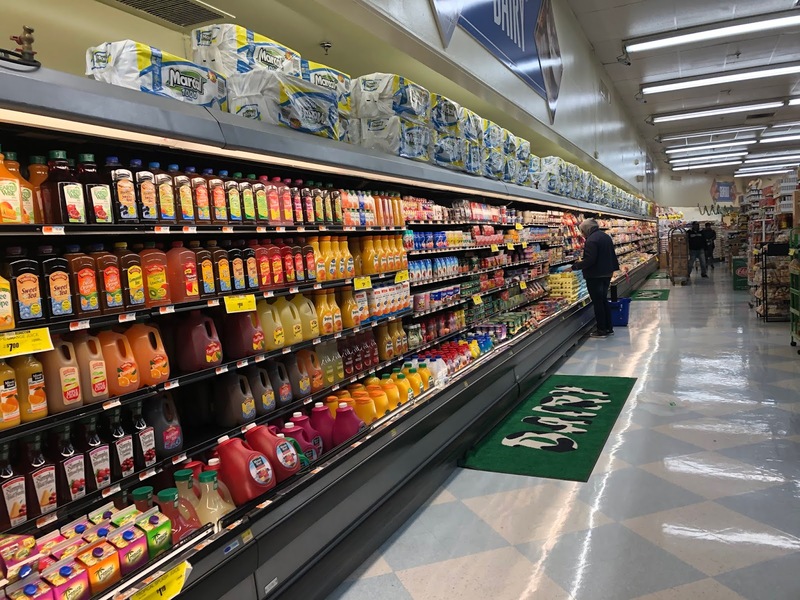 Here's the produce section in the front of the left side room. You can see the doorways into the right side room on the right above. 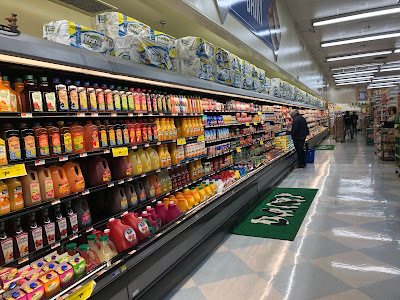 Produce is scattered across a few random cases, most or all of which were probably secondhand when the store opened in 2013. The store has four aisles in total, which as you can see here are labeled A, B, C, and D. A is the first aisle where dairy and the register are. Looking over to the register counter from the produce area. I wouldn't even call this store a large bodega because it doesn't have a deli, and bodegas typically do. It does, however, sell fresh meat. Produce case showing some standard items and a few more exotic ones. The produce wasn't bad at all. 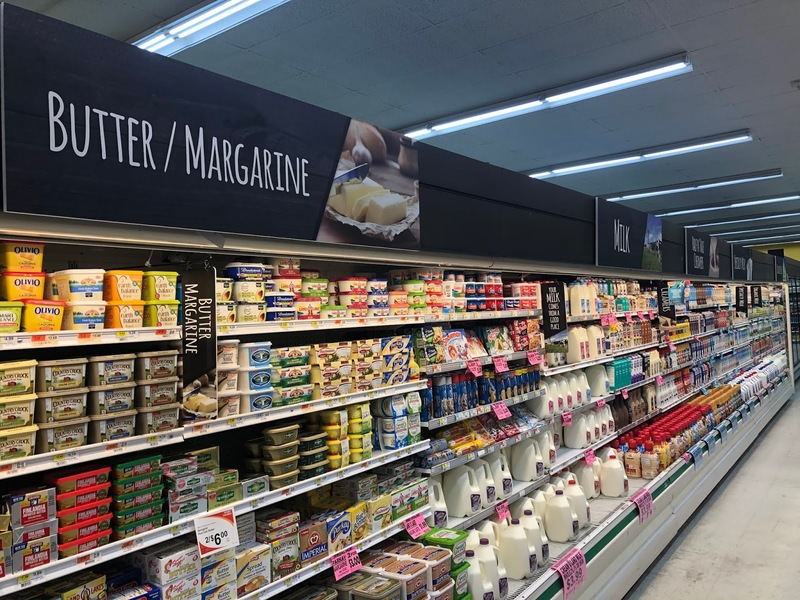 The rest of aisle D contains frozen foods and grocery items. Looking back up towards the front of the store. The door visible here is no longer in use. Doorway to the right half of the store about halfway back. As you can see, the small space is also very cluttered. This makes it somewhat difficult to navigate in places. Looking along the back wall of the store. Although the store is quite small, it does still have staples like pet food, as seen here on the right. 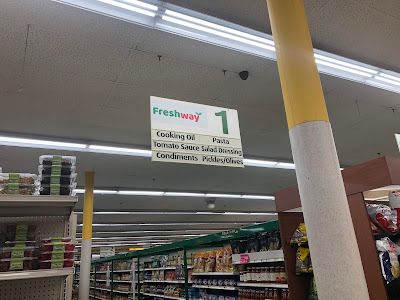 Aisle B, or the second aisle. 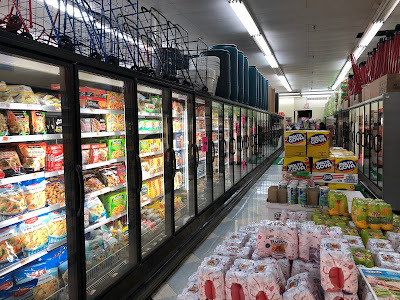 At the back of aisle B there is a small meat section that's kind of a hallway going back, with its two walls lined with meat cases. ...right side. As you can tell from the random displays and products around, the store is not particularly well organized. 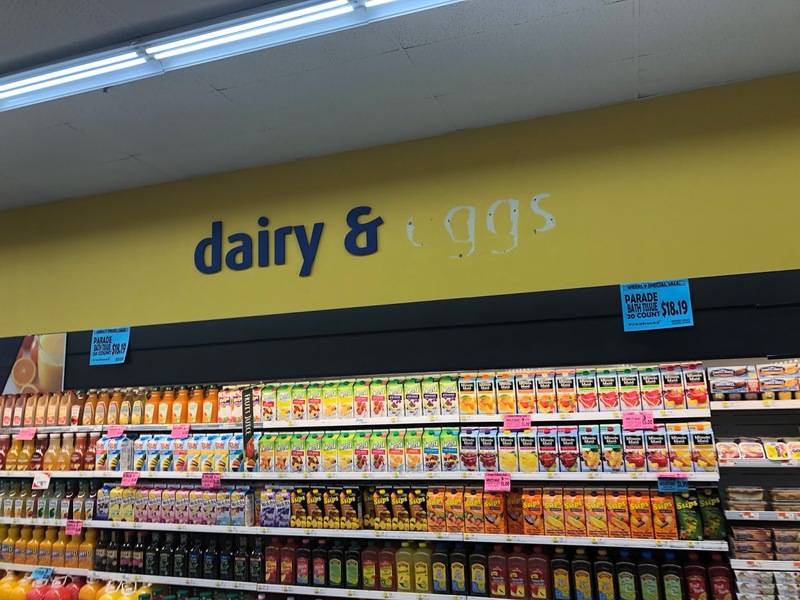 Dairy in aisle A. Which could be the first or the last aisle, depending on how you look at it. And to finish up our tour, can you figure out what's wrong with this picture? Not an unusual problem, but still amusing. 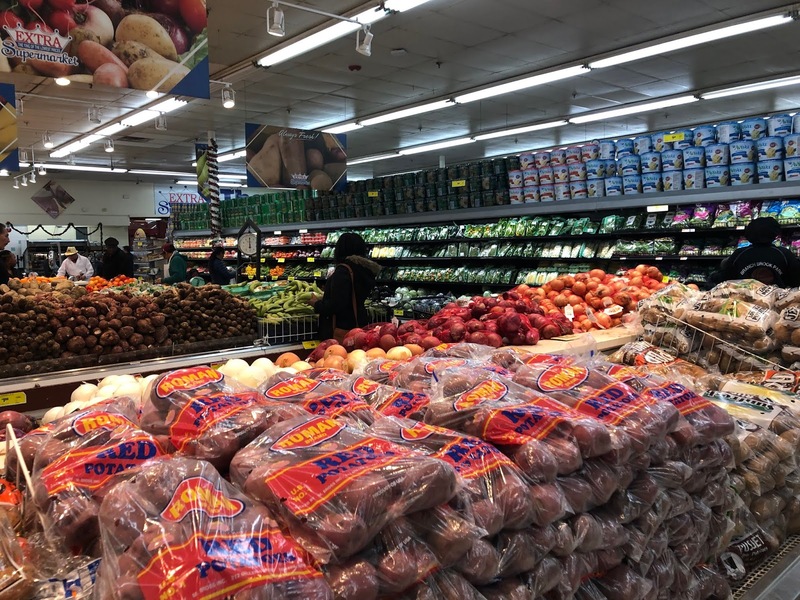 Just in the next block south from A&D and A&S is another small grocery store, this one targeting yet a different ethnic group. 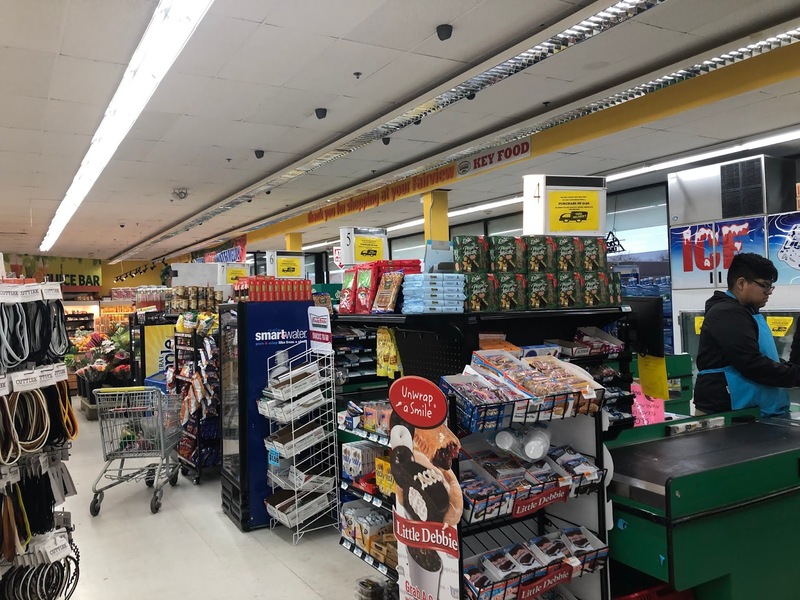 This Mini Supermarket is really a greengrocer with a large grocery selection, although it's true that it sells more dry goods than most greengrocers. Displaying all your (really specific) offerings on the awning or storefront sign makes them sound so much better. Mexican food! Beer! Smoothies! Juice! Flowers! The store's inconsistent use of plurals is interesting--only one cigarette and one vegetable but lots of flowers and smoothies, or what if you come after they take their daily food stamp?--and probably stems from the fact that in Korean, there is no plural version of nouns (most greengrocers in NYC are Korean). I cannot explain the TORtIllas, however. Bay Ridge Mini Supermarket is located at 8006 5th Ave. Almost directly across the street from A&S Deli & Meat Market is the A&D Turkish Market. 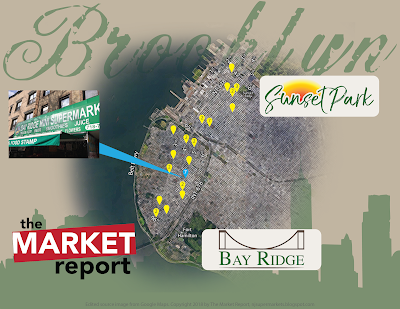 It's another similar small ethnic market, although it targets a different area of the world. 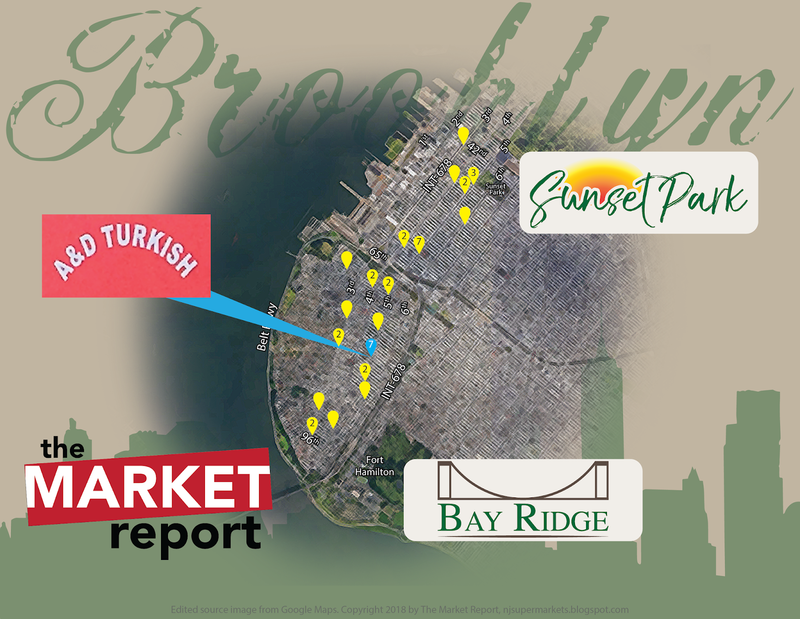 There are many stores that offer Halal meat in this area, although several are farther north. Because the colors tend to be cool, these photos make the day look like it was quite cold. Let me assure you that, although this day was in February, it actually passed 80 degrees (Fahrenheit). That's why you won't see any snow on the ground! I find it funny that the automatic doors take up almost the entire width of the store! A&D is located at 7921 5th Ave.